Jair Bolsonaro was inaugurated as president of Brazil one hundred days ago this Wednesday, Apr. 10. Controversial statements, questionable decisions, and retractions marked the first three months of the retired captain’s government, continuing the erosion of a highly polarized election process. At every bit of news or new announcement, experts, politicians, and the people at large have a harder time grasping the troubled political scenario that has taken over Brazil. 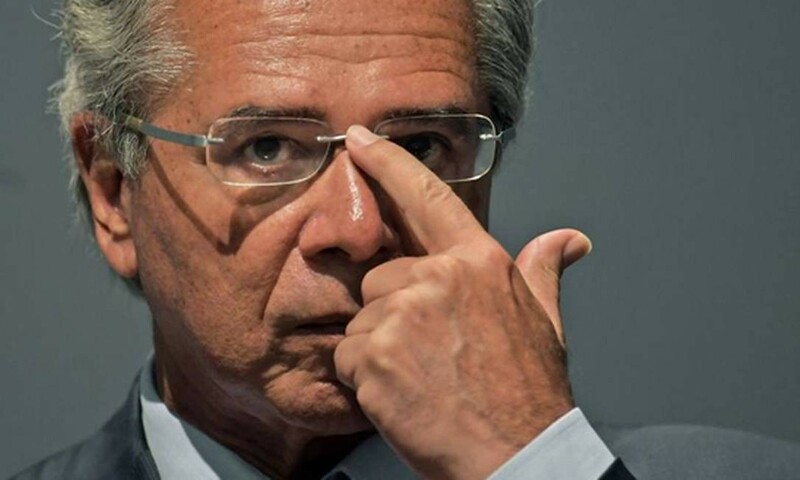 The low approval ratings of the far-right head of state, the articulations of his economy minister, Paulo Guedes, to pass the pension reform bill, and Bolsonaro’s relationship with the United States have been under the media spotlight and sparked strong criticism about the new government over the past three months. While Bolsonaro has been elected with 57.7 million votes, his approval ratings have been plunging. A survey by pollster Datafolha published Sunday showed that Bolsonaro has the lowest approval rating for any Brazilian president in the first three months of their first term since the country’s democratic transition, in 1985. For 30 percent of Brazilians, the Bolsonaro administration so far has been bad or terrible. The president is falling short of expectations for 61 percent of respondents. The expectations of Bolsonaro doing a good government have also dropped. While before his inauguration, 65 percent of Brazilians believed he would do a good or great job, now this rate is at 59 percent. And the number of people who expected the government to be bad or terrible went up to 23 percent from 12 percent before he took office, while the share of respondents who believe his government will be “average” is stable, at 16 percent over 17 percent. A survey conducted by pollster Ibope in March already showed signs that Bolsonaro’s approval ratings were declining, especially among voters with low buying power. While the Brazilian president’s overall approval rating dropped 15 percentage points, it plunged 18 percentage points among low-income voters whose household income is between two and five minimum wages. “These people are trying to reconsider [their opinions]. Maybe they did have reservations about the Workers’ Party, and that’s legitimate, but what was the price of removing the party from office? A lot of people are thinking about it now,” said the expert, who believes Bolsonaro’s approval ratings are likely to continue to drop. Bolsonaro’s anti-politics and anti-corruption discourse is also contradicted as people close to him are reportedly implicated in scandals. In December last year, suspicious banking transactions by Fabricio Queiroz, an ex-aide of Bolsonaro’s son Flávio, made the headlines in Brazil and hurt the government’s image days before the inauguration. A probe found payments of hundreds of thousands of reais to Flávio, who was a state congressman at the time of the transactions and is now a senator. Ministers appointed by the president were also implicated in scandals in the past three months. The makeup of the government is also rather problematic. 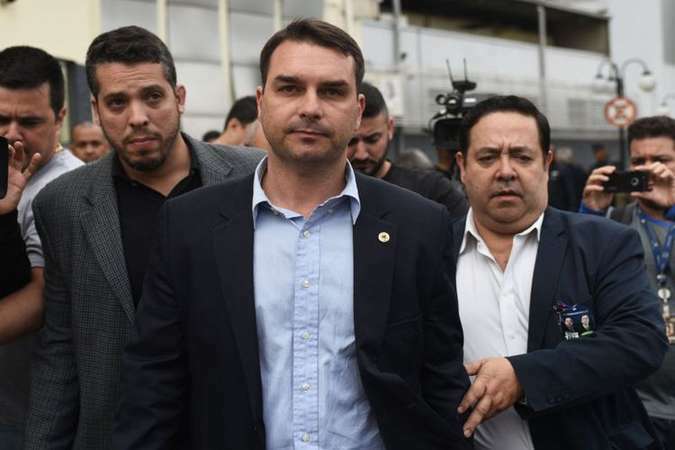 A report by Carta Capital magazine showed that at least nine of Bolsonaro’s cabinet ministers are being investigated or charged in court. In February, an investigation was launched into allegations disclosed by the newspaper Folha de S. Paulo against Gustavo Bebianno, Bolsonaro’s Secretary-General and one of his closest allies, about a campaign financing scandal involving dummy candidates in the country’s 2018 general elections. After clashing with Carlos, another son of the president, on Twitter, Bebianno was fired a few days later. The most recent casualty suffered in the Bolsonaro administration happened on Monday, Apr. 8, when the Education minister Ricardo Vélez Rodríguez became the second cabinet member to be fired this year. A controversial figure appointed by polemicist Olavo de Carvalho, Vélez became notorious for his conservative views on family morals, religious beliefs, and values he wanted to promote in Brazilian schools. He tried to implement rules – and had to back down after a huge backlash – to allow school books with errors and no bibliographical references. He later submitted a letter to tens of thousands of schools asking them to send the cabinet videos of students singing the Brazilian national anthem, without parents’ consent – and once again had to retreat after questions were brought up about the constitutionality of the request. In one of his last public addresses before his resignation, Vélez made a case for changing the content of history textbooks to paint a better picture of the 1964 coup d’état and the civil-military dictatorship that ruled the country until 1985. After replacing 20 officers in his cabinet, upsetting different groups of the government, Vélez himself was replaced, a decision announced by Bolsonaro on Twitter. A bill to amend Brazil’s Constitution to change the rules of the pension system in the country is one of the flagship proposals of the Bolsonaro administration, which is racing to have the Congress pass it. While the Brazilian pension system in effect today is based on principles of solidarity and universality, the bill proposed by Bolsonaro’s Economy minister, Paulo Guedes, eliminates the public pension fund and establishes a capitalization system, also forcing workers to retire later. The proposed overhaul has prompted harsh criticism, as experts and activists argue it would especially affect the most vulnerable groups of society, including poor and informal workers, older adults, people with disabilities, black women, and rural workers, while not solving the budget deficit problem. Flávio Roberto Batista, a professor at the Law School of the University of São Paulo, argues that the proposal’s main goal is to benefit the financial market, and that the government is rushing to pass it with no conversations with the different sectors of society because it goes against the majority of the workers of the country. 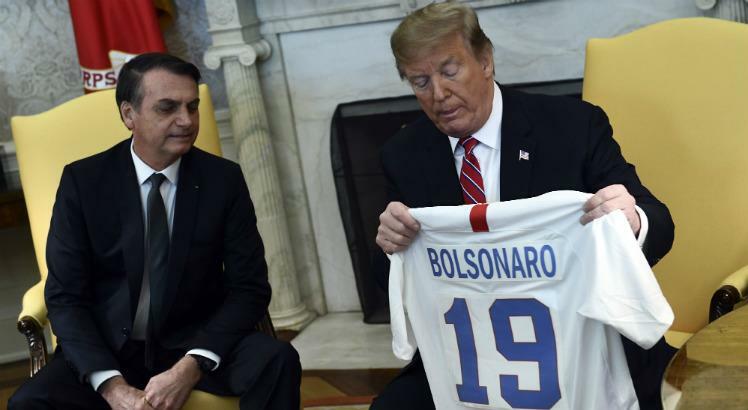 Bolsonaro’s visit to the United States to meet with president Donald Trump in March was celebrated by supporters and criticized by experts, who are concerned that the relationship established between Washington and Brasília is based on the Brazilian government making a series of one-way concessions. After 20 years of talks, representatives of both countries signed an agreement that will open up the Brazilian Alcântara space base to US satellite launches, a move that diplomats fear could mean “selling or leasing out” the country’s assets, violating its sovereignty, as part of an ultra-neoliberal turn in the country’s foreign policy. It’s not just the space base near the equator that is facing risks under the Bolsonaro administration. A dossier published in March by Tricontinental: Institute for Social Research showed that the Brazilian Amazon is being increasingly targeted by foreign mining operations and agribusiness. After so many controversial moves and episodes in only one hundred days, the Brazilian people, experts, and politicians started to question the political skills of Bolsonaro and his cabinets. 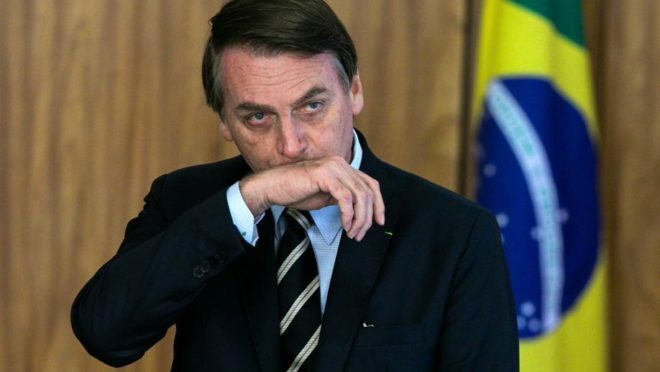 Rosemary Segurado argues that Bolsonaro’s political career was always marked by extremist, authoritarian attitudes, which shows his inability to maintain conversations with other parties and political opponents. “A president has to be someone who adds something to the country and its numerous differences. Not the opposite of that. And that’s not what he shows,” the expert says. Hey Buddy!, I found this information for you: "The first 100 days of Bolsonaro’s misgovernment in Brazil". Here is the website link: https://peoplesdispatch.org/2019/04/10/the-first-100-days-of-bolsonaros-misgovernment-in-brazil/. Thank you.